City of Ariogala is in Raseiniai district in Kaunas county, Lithuania. The city itself forms Ariogala City Eldership with 3,627 inhabitants. The outskirts of the city forms another Ariogala Eldership with 4610 inhabitants. "The History of the Town: Ariogala is one of the oldest towns throughout Lithuania. The original meaning of the word "Ariogala" might be related with the edge, the end or the border of something, however, the root of the word er- or ar-) lets conjecture that this word might be derived from some name. Therefore, Ariogala might have been "the edge/end of Ario (or Erio)". The history of Ariogala is immemorial. Firstly it was mentioned in the jottings of Mindaugas in 1253 when he granted half of the lands of Ariogala for the newly established episcopate of Lithuania. Later, in 1257 the lands were transferred to the bishopric of Livonia. Some of the historical sources claim that Ariogala was the capital of Mindaugas. Gediminas, The Great Duke of Lithuania, and his posterity were the representatives of the dynasty of great dukes. Ariogala was an important station at that time and had to withstand numerous onslaughts of crusaders. People were frequently killed, held prisoners, driven to Prussia. Many of assaults are mentioned in the chronicles of crusaders: in 1294, 1322, 1348. Only in 1382 the marshal of the Crusader Order, Kun Hotenshtein, occupied and burnt the wooden castle of Ariogala. Afterwards, the castle was not mentioned in the historical sources. One of the last assaults of crusaders was made mention of at the time of the reign of Vytautas (1405). The assaults stopped just after 1410 when the Grand Duke of Lithuania Vytautas beat up the crusaders in the Battle of Þalgiris. Ariogala became the estate of the Grand Duchy of Lithuania in the time of Vytautas reign. It began to increase around the XVth century. In the period of Þemaičiai baptism (around 1426 ) the Church of Roman Catholics was built with Vytautas concern. Ariogala was given partial rights of town. It got the privilege to develop trade and to have a market. Stanislovas Augustas, the ruler of Lithuania and Poland, bestowed on the rights of free town, seal and emblem to Ariogala on 12 April, 1792. 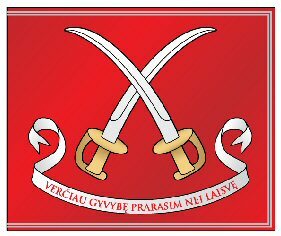 Two crossed swords in red background with a crown over and inscription beneath "We'd better lost our life than Freedom" were depicted in the emblem. Such a militant emblem was given not accidentally. Crumbling and inner contradictions destroyed the country, however, it was tried to be saved by various reforms. It was strived to provide more rights for self-government. The swords in the emblem remind that freedom can be protected only with a weapon. Lithuanian President V. Adamkus comfirmed the emblem of Ariogala by the decree announced on 15 November, 2001. Only for three years Ariogala could preserve its self-government. The rights of Ariogala town were abolished on 18 March, 1795. At one time there lived many Jews in Ariogala. They bought goods, sent them to Prussia, traded in wax, honey, salt, fur and other products. They had several inns. According to the legends, Ariogal was a big city in ancient times. In the time of Russian Czar, Ariogala declined and turned into a marginal town Padubysys. An important road from Kaunas to the lands of Þemaičiai took past it. Ariogala burnt three times before World War I. In 1915, it was completely burnt during the war between Germans and Russians and only around thirty huts remained. There is no news when the first school was established in Ariogala. It is known that there was a parish school in 1852. It was closed after the 1863 revolt and Russian school was established instead. The school for boys was established in 1878. Later it was reorganized into a mixed school, however, separated schools for boys and girls were set up in 1907. In 1908, the fellowship "Saulë" established Lithuanian school in Ariogala. During the occupation of Germans there was no school, its buildings were burnt. Only after the independence normal work began at school. 185 schoolchildren attended it in 1933. In 1923, the school for Jews was established. Sixty eight children attended it. When Lithuania was independent Ariogala was the council of district. There were two grammar schools, a post, medical and veterinary offices, police station, two fellowships of small credit; a pair of mills, electric station, a cooperative, dairy, many artisans. Whithout the parish of Catholics, there was the parish of Evangelicals, three prayer houses that belonged to Jews, three libraries, the place for reading, many culturial, economic, religious, youth organizations. The whole Lithuania, including Ariogala, experienced one more trial in the year of World War II. Germans killed almost all the Jews who lived in Ariogala. Quite a lot of Lithuanians were exiled to the expanse of Siberia. From 1950 till 1962 Ariogala was the centre of the district. Ariogala, Betygala, Èekiðkë, Pernarava and part of Girkalnis were in the newest district. The establishment of the centre of the district in Ariogala, urged the restoration of the town and set the fast developement of it off. Since 1962 Ariogala is ascribed to the district of Raseiniai and still has the rights of the town. According to its territory Ariogala is the second town in the region of Raseiniai. Marvellous surroundings distinguish Ariogala. Torrential Dubysa and its hollows fascinate everybody's eyes. In the Valley of Songs, which is in Ariogala, not only local but also republican occasions take place. Currently, the territory of Ariogala occupies 482 hectares. 41% of the area is built up; various parks occupy 25% and agricultural places take 13%. The rest of the territory is occupied by waters and areas used for different purposes. There are two cosy parks in the town. According to the data produced in 2001, 1,743 men and 1,954 women lived in Ariogala, altogether 3,697 people. At the moment 1653 families live in Ariogala. Today there is a post office in Ariogala ( works from 1880 ), bus station, kindergarten, grammar school, secondary school (1918 - 1948 it was grammar school, 1948 - 1949 it was gymnasium ), library, church, recreation centre, restaurant, hospital, clinic, pharmacy, around 20 shops, veterinary hospital, market. The most important industrial enterprises are: The company "Ariogalos Gelþbetonis" ( the former shop of Raseiniai concrete counstructions ) established in 1968 and the shop of Raseiniai sewing concern "Ðatrija". In 2002, UAB "Skorgenas" was established in Ariogala. It goes in for building small ships. Postwar liberty battles that took place in this region are remembered by the chapel, which was built in 1991 in the cemetery of Ariogala, by the initiative of exiles and political prisoners. The chapel is devoted to partisans and it is a monument for the exiles. Traditional jamborees " The fire of freedom - for the future generations " are organized in the Valley of Songs. They began in 1991 (after the regain of independence ) and started glorifying the name of Ariogala. Every summer partisans, former political prisoners, exiles and other participants of Liberty freedoms for Lithuania gather in Ariogala. The way to the Valley of Songs is set with the sculptures created by the folk artist Juozas Grabauskas. The town of Ariogala had the great anniversary of 750 years on 12 July, 2003. The town appeared in new colours, surrounded by wonderful squares, green parks, the homesteads in the background of flowers. After the midday, the lovers of theatrical art gathered on the churchyard of the church of Ariogala where pupils of Ariogala Secondary School introduced to the evangelical performance (director A. Kazlauskas) " Ir þodis buvo Dievas ". The audience were intrigued by the passages from St. Matthew and other Gospels about Christ and the truths of his teaching. The most memorable things were: the direction and original perfomance of young individual actors; professional expression of the message of the work. Memorial stone was consecrated near the buildings of local authorities of the town. The note was inscribed in the granite board, which was hung on the stone : "750 years - to Ariogala, 1253 - 2003 ". People from Ariogala will remain for a long time in the history: bookdistributor Mykolas Račkus, historian Vincas Trumpa, prof. Stasys Ðalkauskas, prof. Kazys Ðalkauskas, dr. Audronë Globienë (1958), dr. Kazys Lekevičius, journalist Aldona Svirbutavičienë, writer Jurgis Savickis, painter Aloyzas Stasiulevičius and others." The coat of arms and the flag are presented in its website, but in Lithuanian only. Flag is also shown in Wikipedia.